When you walk into just about any McDonalds in the United States, you know what you are getting. The McNuggets in California are the same shape as the ones in Virginia, the special sauce on the Big Mac is the same (it’s some form of thousand island, right? ), the food is the same. The employees all wear similar uniforms, the décor is mostly the same, some are older, some are newer, but most people know a McDonald’s when they see one. I can say with 100% surety that this is not the case with taxicabs. So, what do a Grandma from Virginia, a Belgium immigrant and a former factory worker have in common……no they don’t all own a McDonald’s, but they all own Yellow Cab Companies. Much like McDonald’s anyone can own a cab company, but unlike McDonald’s, most people who own a cab company are not franchisees. These are all independent, mostly small businesses. The cab drivers are for the most part independent contractors that are licensed by the jurisdictions they are operating in. There is no gigantic Yellow Cab building in New York City telling every Yellow Cab that they have to buy a certain vehicle and paint it a certain color. 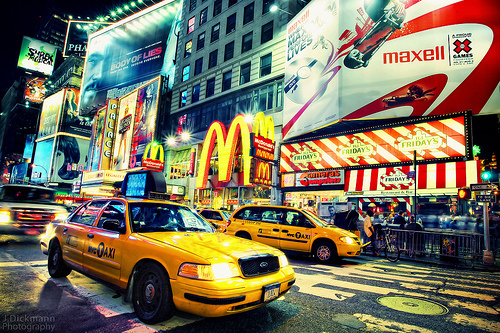 There is no Yellow Cab marketing team that provides us with commercials and marketing tools. It’s just the grandma from Virginia, the immigrant and the former factory worker, standing alone, making decisions that affect their business and their family. The bottom line is sometimes whether or not they will get to cash that paycheck this week, or hold it to pay employees, if they have made enough for their kid to go to that football camp this month, or if they can afford that picnic to let their drivers know how much they appreciate what they do to keep their companies good image. When you see our commercials for “shop small, shop local” know that, this is what you are getting, Small and Local. We paid for our commercial ourselves, sure we got it on Fivver and it wasn’t THAT expensive, but it still cost our family to let you know what we are all about.